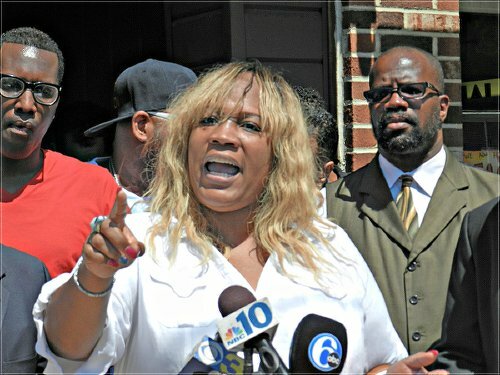 Family members of Brandon Tate-Brown and a broad coalition of supporting organizations gathered for a news conference on Aug. 5 near the site where he was killed by a Philadelphia police officer on Dec. 15, 2014. They renewed a call that charges be filed against the responsible officer in light of newly released evidence. Police shot Tate-Brown in the back of his head following a routine traffic stop in the city’s Mayfair district. Tanya Brown Dickerson, mother of Brandon Tate-Brown, speaking Aug. 5 in Philadelphia. The Rev. Mark Tyler from Philadelphians Organized to Witness, Empower and Rebuild (POWER) opened the conference. He announced that the NAACP, the National Action Network, the Black Clergy of Philadelphia, the Guardian Civic League and others had formed a new coalition to demand justice for Tate-Brown. 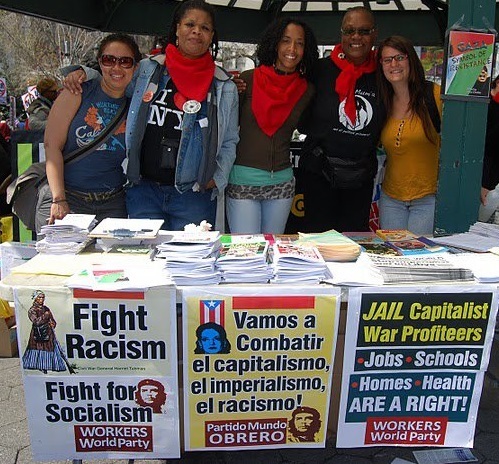 The coalition will continue the work initiated by the Philadelphia Coalition for Racial, Economic and Legal Justice. Tyler and other speakers repeatedly thanked the REAL Justice Coalition for tirelessly pushing the case when others were unwilling to take it on. REAL had demonstrated in a bitter snowstorm and took arrests when the group challenged Philadelphia Police Commissioner Charles Ramsey and District Attorney Seth Williams. “Thanks to these young people who were there from the beginning we now know the truth of what happened,” Tyler told those present. Tyler outlined new evidence in the case that was found on the Philadelphia Police Department’s own website. As a result of public pressure and an investigation of the department by the federal Department of Justice, this website now records details of every police-related shooting. The original report filed by police in December 2014 alleged that police officers Nicholas Carrelli and Heng Dang stopped the car that Tate-Brown was driving at 2:40 a.m. on Dec. 15, 2014, because he was driving without his lights on. According to their original report, the cops saw a gun in the car and ordered Tate-Brown out. The officers originally claimed that Tate-Brown subsequently returned to the passenger door and was reaching into the car for the gun, so they were forced to shoot him in “self defense.” The PPD website was recently amended to state that one of the officers only “observed the weapon during the course of the stop” and that Brown “ran behind the vehicle and was heading toward the side door” when he was killed. Tate-Brown’s family was able to keep media attention focused on the case as a result of the REAL Justice Coalition’s campaign demanding to know: “Who killed Brandon Tate Brown?” This pressure allowed the family to obtain video coverage of the incident from store cameras in the area. The videos provided evidence that disputed the police account. They showed, for one thing, that Tate-Brown’s headlights were clearly on. Another camera showed him running away from the police who eventually cornered and killed him with a shot to the back of his head behind his car, not at the passenger door as the cops had originally stated. Despite this evidence and mounting public pressure, DA Seth Williams refused to charge the officers. Asa Khalif, cousin of Tate-Brown and a member of the REAL Justice Coalition, stated, “There are no good cops when ‘good cops’ stand by and allow injustice to go by and say nothing.” He demanded that Officer Carrelli be arrested and taken off the streets. 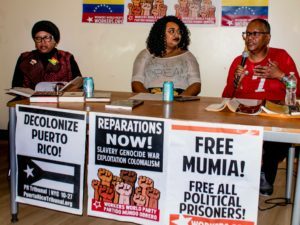 Other speakers included Rochelle Bilal on behalf of the NAACP and the Guardian Civic League, a group representing Black police officers; Paula Peoples with the National Action Network; and the Rev. Terrence Griffith, senior pastor of the historic 205-year-old First African Baptist Church of Philadelphia and current president of the Black Clergy of Philadelphia, who blamed the media for not pressuring the police commissioner for answers. Rev. Tyler concluded the press conference by noting that while Philadelphia Mayor Michael Nutter set up a special commission to carry out recommendations made by the DOJ study, nothing has been done since, because “nothing was intended to be done.” Tyler called for an ongoing coalition of community groups, including those represented the conference, to keep pushing their demands for the arrest and indictment of Officer Carrelli and implementation of all 91 recommendations made by the DOJ.